The men at the Precision Optical Instruments Laboratory, eventually to become Canon, faced many challenges in the pre war years and immediately after. Besides the problems of the war and the shortage of material and capital that resulted, they had no facility to create lenses. Lens grinding and polishing is a skilled hi tech process and to create the infrastructure to do this was daunting. They decided to approach Nippon Kogaku Kogyo, one day to become Nikon, to see if they could acquire lenses there. 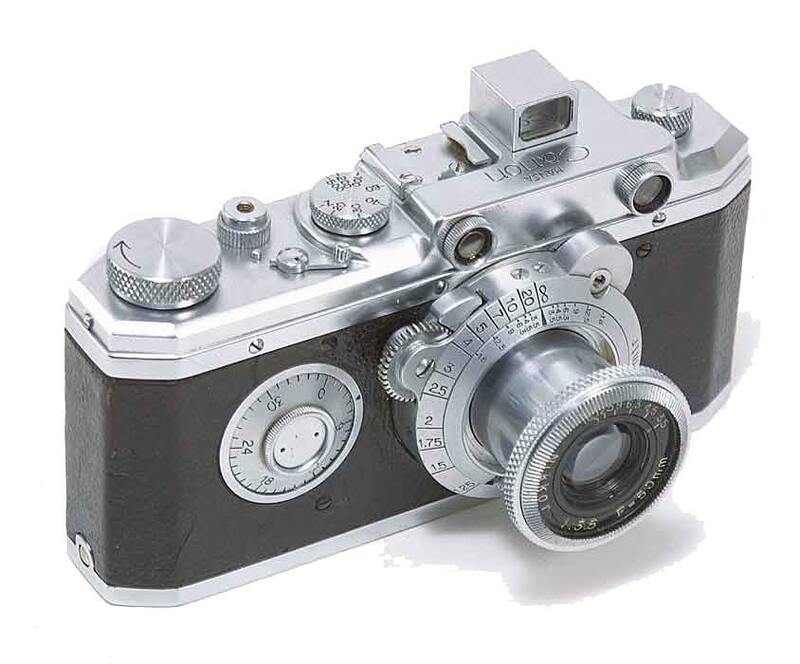 An agreement was reached that Nippon Kogaku would supply the optics, the rangefinder and the lens, for the new cameras. 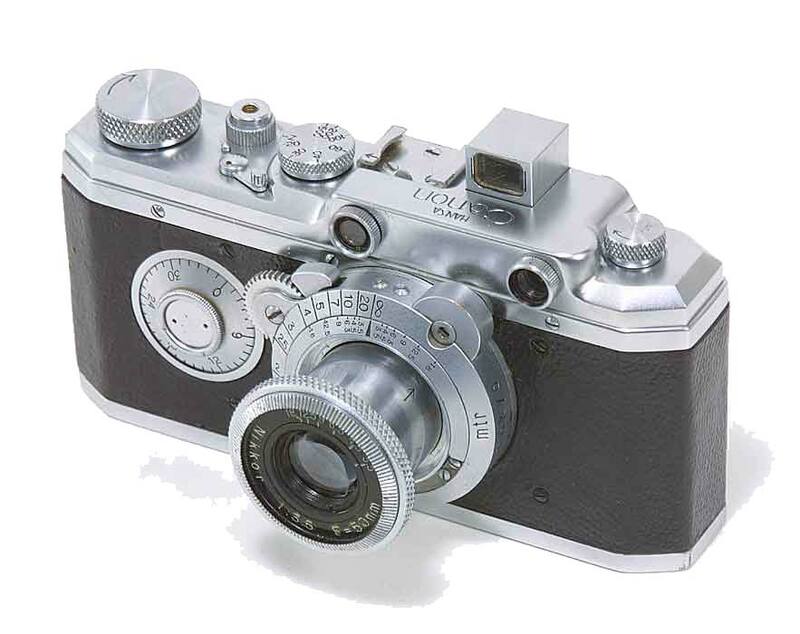 The first Canon camera was introduced to the market in February of 1936 as the “Hansa Canon”. It is interesting that the first Canon Lenses were Nikkors. Go figure! So the first Canon camera came out sporting a Nikkor 50mm f/3.5 lens. As we discuss lenses we are going to be coming up against technical terms which we should get straight. So below you will find several headings which will clarify what I mean when I use these terms. They are in no particular order. I will add terms as they come up. Maybe one day I will arrange them alphabetically but they won’t be enough of them to be a problem, I am sure. In the beginning all lenses had spherical surfaces. They are the easiest lens shape to make, but are not best suited to rendering a sharp image as they cannot make parallel rays of light converge at the same point. This causes a problem called spherical aberration. Canon designers discovered that an aspherical (non-spherical) lens shape would eliminate these spherical aberrations, because the curvature of the lens could be used to converge the light rays to a single point. The degree of asphericity is very small. Originally such lenses were polished to a spherical shape and then hand ground to crate the final aspherical shape. Very time consuming! Canon developed special equipment to perform this task but it still adds considerably to the cost of a lens. 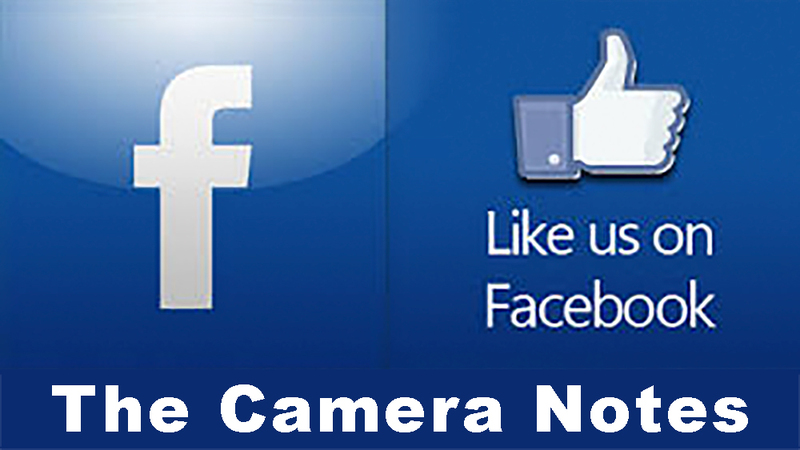 It was not until 1971 that the first SLR camera lens with an aspherical lens element was produced. But it was not perfect. In fact, it took another two years before manufacturing techniques reached the levels required to really achieve large gains in image sharpness. Aspherical lens elements compensate for distortion in wide-angle lenses, and compensate or eliminate spherical aberrations in lenses with a large maximum aperture. Lenses with aspherical elements also tend to be lighter and more compact than previously possible with earlier lenses of the same specification. For interchangeable lens cameras the flange focal distance (FFD) or flange-to-film distance or flange focal depth or flange back distance (FBD) or flange focal length (FFL), or register, you take your pick, is the distance from the flange or mounting surface that the lens rests on to the sensor surface. Fluorite is a naturally occurring crystal. In nature it grows in small crystals and only a few are useable in optical equipment. In the 19th century some were used in microscope lenses which are very small. These crystals have three special properties that make them eminently suitable for use in lenses: they transmit infrared and ultraviolet light well, have very low refractive indicies and low dispersion. To use these natural crystals for relatively large camera lenses was not feasible so Canon set about growing its own synthetic fluorite crystals in large enough quantities to create photographic lenses from them. Florite is fragile and will break easily so this presented many challenges. The engineers at Canon developed a new grinding technique to ensure flawless fluorite lens elements. The downside is that it takes four times longer to grind a fluorite element than a glass element which is one of the reasons for the increased cost of an L-series lens. The results, though, are lenses that all but eliminate chromatic aberration, resulting in sharper images. S.C. stands for Spectra Coating and S.S.C. for Super Spectra Coating. The full explanation involves a little science mixed liberally with Canon marketing. Every lens surface, either going from air to glass or glass to air, reflects a certain percentage of the light. This is a problem because it is stray light in the lens bouncing around and generally lowering contrast. For this reason, in the early days, lens designers wanted to keep glass surfaces to an absolute minimum. It was the only way to a nice contrasty lens but, of course, image sharpness suffered. Zoom lenses were out because the surfaces the light had to encounter were innumerable. Now for the science bit. It was discovered that if you coated the lens with a hard clear substance, made it about a half wave length deep, that a strange thing happened: for a given wavelength the reflection was cut to almost nothing. The light hit the coating and a small percentage was reflected. It hit the second surface, the coating to glass surface, half a wavelength away, and more was reflected. But these two sets of reflected light were close enough in frequency that one cancelled the other out. But only for one frequency. However, it was found that if you used a second coating in just the right way, you could hit a second frequency as well and broaden the range in which reflections were cancelled. Maybe they use even more coats. I am not sure on the details and, anyway, this is a very simplistic explanation. Now for the marketing part. Canon called this coating their Spectra Coating. A single layer was denoted as S.C.. But if they used two layers for a better result, and higher production cost, they called it their S.S.C. or Super Spectra Coating. Other manufacturers do much the same thing and have their own pet names for their process. F stops are a funny concept. I have used them for the best part of sixty years and yet when I decided to define them I had to look up what was really meant. 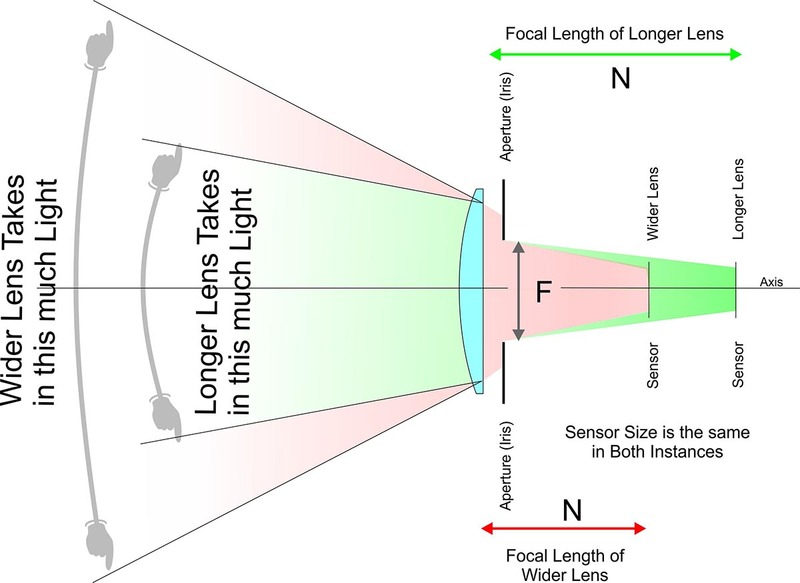 The problem we seek to solve is how to describe how much light a lens lets through regardless of what its focal length or lens diameter may be. The amount of light depends on focal length because the wider the field of view the more light is able to enter the front element. A longer lens lets less light in because it accepts light from a narrower angle. The focal length, “F” on the diagram above, is the distance from the lens to the focused image on the film/sensor. But the amount also depends on how wide the aperture diameter, or “F” on the diagram above, is. Obviously the wider the aperture, the bigger “F” is and the more light comes in. If we call f a ratio of the Aperture over the Focal Length, F/N, we get the f number. If we create an adjustable iris and put click stops so that the lens stops automatically at various settings, we get f stops. For a given amount of light, different lenses of the same f number let in the same amount of light. That is why it doesn’t matter what lens is on the camera when determining exposure. The maximum diameter of the lens will yield its f number. The stop it is set to is its f stop. These f stops by tradition are fixed at 1, 1.4, 2, 2.8, 4, 5.6, 8, 11, 16, 22, 32, 45 and 64. They are referred to as “full stops” and the change from one to the next is a doubling or halving of the amount of light the lens allows in. If you look at shutter speeds they are divided the same way so that the jump from 125th and a 250th is a halving of the amount of light allowed in. So a setting of f/2.8 at 125th of a second allows the same amount of light in as f/2.0 at a 250th. It’s neat isn’t it.